Before this bridge arrived on the scene as an 18th century world wonder, earlier bridges were mostly built of stone, usually with several low arches. The particularly novel aspect of the Iron Bridge’s design, then, was the high single arch, devised to allow the large sailing barges, known as Severn trows to pass beneath without lowering their masts. This was a clear piece of Coalbrookdale Company bravado, since the trows would have had to lower their masts for all the numerous other Severn bridges, both up and downstream of the Iron Bridge. Looking at the sleepy river today, it is hard to imagine that in 1712, Coalbrookdale’s iron works were exporting 1,400 tons of iron wares downriver. It’s hard to imagine too, that although a hundred miles from Bristol, that the towns of Ironbridge and Broseley (on either side the bridge) were busy inland ports, with boat builders’ yards, and locally owned trows. 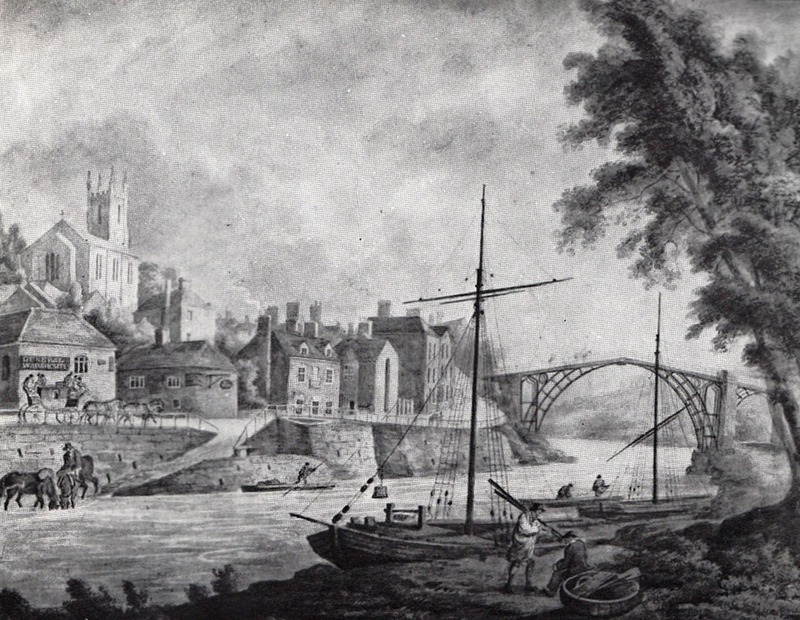 The trade also went upriver to Shrewsbury which in turn exported cloth from the Welsh hinterland and local agricultural produce. 10 tons of ironware; 8 tons of cheese; 8 packs of Manchester ware; 2 packs of sadlery ware; 2 hogsheads of oats; 2 barrels of oats; 8 hogsheads of hair; 80 crates of earthenware; 1 barrel of brass; 2 trunks of wearing apparel; 2 boxes of wearing apparel. 40 bags of cotton wool; 40 packs and a truss of cloth; 4 hogsheads of train oil; 1 ton of saltery; 2 barrels of herrings; 5 cwt. of salt fish; 4 cwt. of red lead. The prestigious nature of the trade is perhaps embodied in the Severn Warehouse, now part of the Ironbridge Gorge Museum Trust. 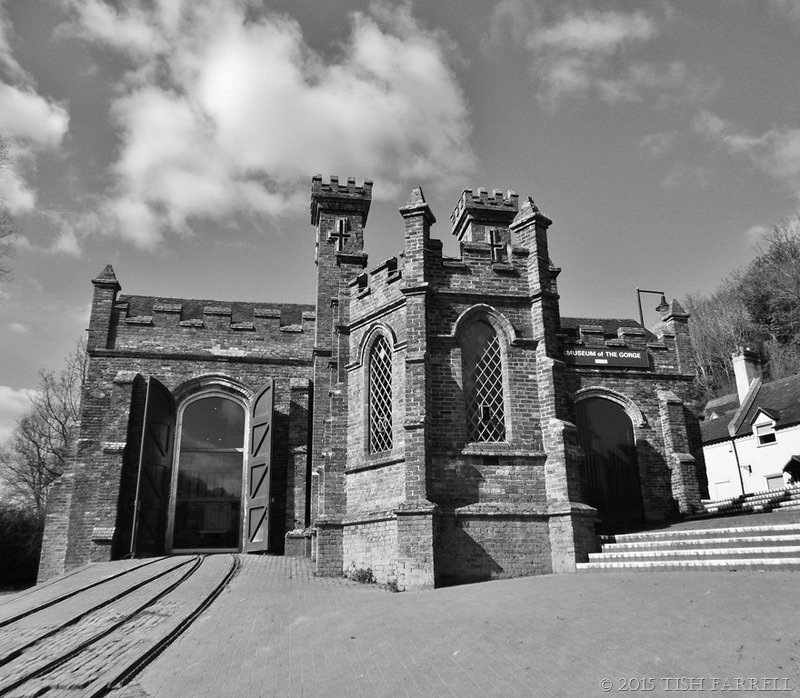 It stands on the river mid way between the Ironbridge Power Station and the Iron Bridge, and was built by the Coalbrookdale Company in 1834 in flamboyant Gothic Revival style. Down its iron rails to waiting barges would have trundled carts loaded with iron castings of every sort, both functional and decorative, heading for markets throughout Britain and across the Empire. It did a particularly thriving trade in iron bellied, so-called Missionary Pots – some holding up to 400 gallons, and thus big enough to hold a missionary or two. They were actually used for processes like soap making and rendering down whale blubber. 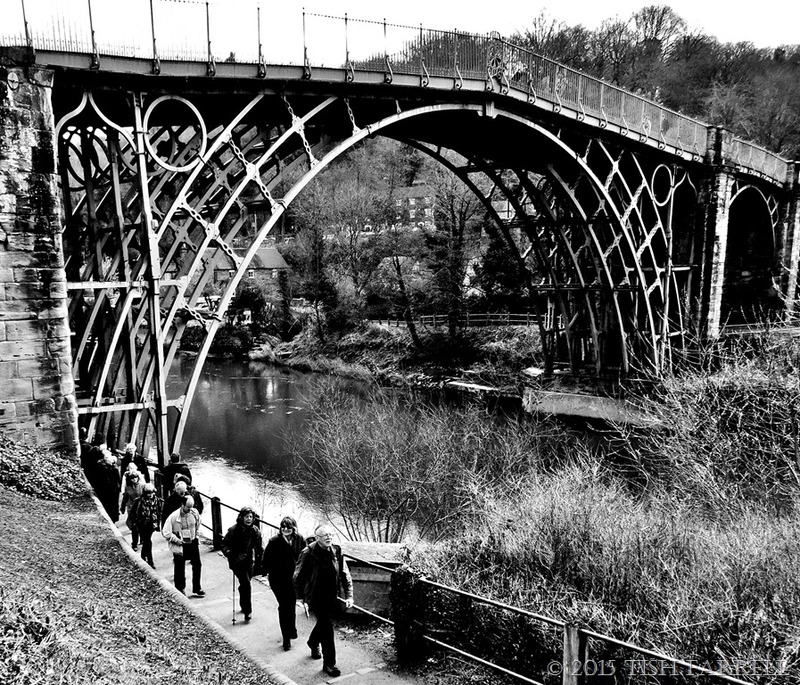 Posted on April 19, 2015 February 10, 2018 by Tish Farrell	This entry was posted in Industrial History, photography and tagged Black & White Sunday, David Starkey, Gloucester Port Books, Ironbridge Gorge Museum Trust, Ironbridge Power Station, Severn trow, Tish Farrell Writer, World Heritage site, world's first cast iron bridge. Bookmark the permalink. The power station on the river is a real contradiction. I still love this bridge and the stories you are sharing about it and the surrounding area. I like your stories and the pics. I love both yours and Graham’s photo 🙂 This is the first time for me to see a single high arch steel bridge. Fascinating. I appreciate the history behind the towers, Tish, and these beautiful captures. If I may be so bold …. I don’t know what this will look lie until I press click, so feel free to delete if it looks awful. Lovely post. It would be a pity to lose them … beautiful when lit up in their own way. Interesting post and great photos. I do wonder what all that hair was destined for! That’s a great bridge. We also live in an historical industrial zone, now returned to sleepy rural life. We have the canals, the hulks of old factories and mills. Many have burned down or turned into malls … or in one case, senior housing. The industrial era left a lot of polluted water behind and even now, more than half a century since the last working mills closed up, we are finally almost back to having some healthy waterways. Some real old history there. Cast iron I suppose? Fascinating, beautifully written and knowledgeable as always. I’m a sticky-beak though. I want to know more about the consultancy! 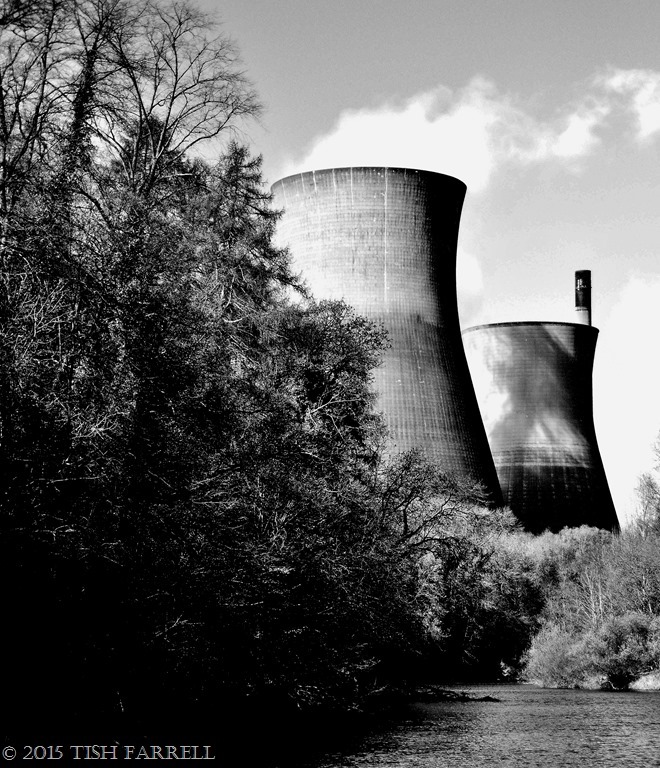 You have a very benevolent attitude to cooling towers. I guess that’s because they aren’t still in use. For many years I lived in area where brown coal is used to provide the energy for the State I live in. 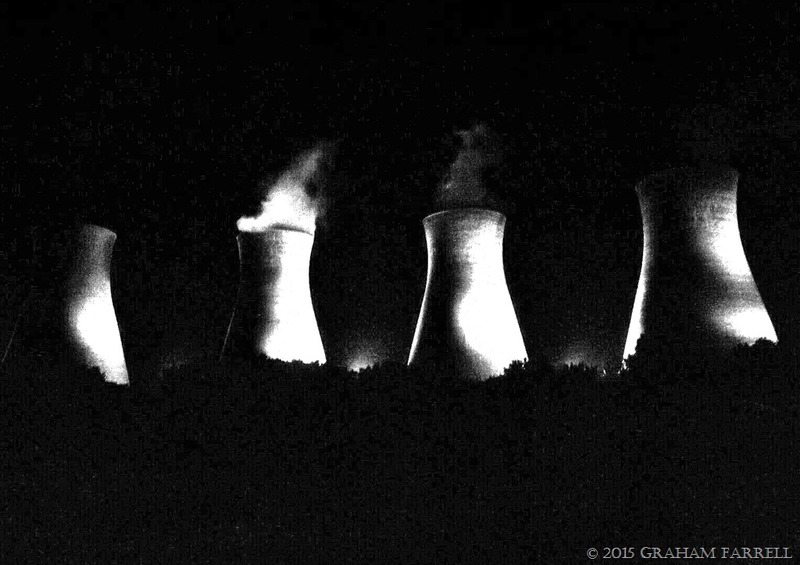 There are many cooling towers and chimney stacks belching brown smoke across the skies. The towers are lit up at night and, to me, they look like malevolent beings hovering over the land. I can appreciate that malevolent vision too, Suzanne. The Gorge ones benefit from their setting, but when you see them in a totally urban or industrial setting, I agree that they are v. overbearing, if not downright intimidating. 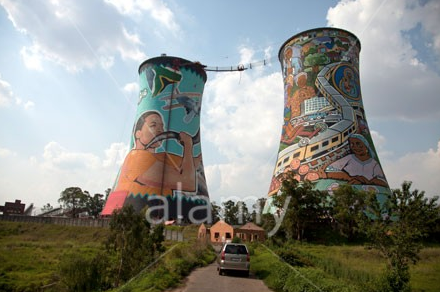 If you look at Ark’s comment above yours there’s a link to a photo of what they did to their towers in Soweto. Much more creative. Oh lucky you, Tish ! – here our maniacal guvmint does nothing but sing the praises of coal. UGH ! They’ve removed all incentives to go solar, so that they can keep their mates in luxury. Bastards. I think your towers do look impressive: but could they also be actually utilised within …? Yup – all western guvmints are currently run by mad people, it seems. It is just great, isn’t it. When the Ironbridge towers are finally decommissioned, I’m kind of envisioning massive artwork on them showing ironworkers and barge men and women. What a backdrop for the Gorge that would create. 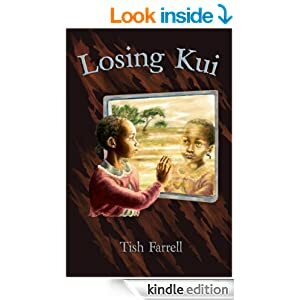 thanks for the reply Trish – and I assumed it did not open – when I wrote that part of was thinking of the draw bridges here on the east coast of the US – and how they still amaze me when they open up. Another very interesting post. All the best! This has been very interesting. things change..for the good or not. Yes and sometimes that is harder than it should be…but it is up to us. That’s so true, too, Beverly. We tend not to like it, and that’s a big hump to get over before we think of anything else.